Not much is written these days about the lowly desktop computer. Smartphones, tablets and laptops take center stage. You may disagree, but I believe the desktop is going to be around for a long time. Its relatively low price and super performance numbers can’t be matched in other form factors. Cloud computing that moves processing power to a remote location and continuing advancements in low power performance chips will further erode desktop sales, especially at the low end, but you’re going to have to pry this design from the dead hands of engineers and scientists who demand high-powered local computing. These types of systems are power pigs and even their lower performing counterparts are getting smaller (small form factor desktops), increasing thermal management challenges. Why didn’t the market embrace a proposed standard in PC architecture design that offered, among other things, substantially improved thermal headroom? Major OEM’s produced it and millions were sold, yet it remains a virtual footnote in PC system design. I’m talking about BTX architecture (motherboard layout and system design). Since the mid-1990’s the ATX (Advanced Technology Extended) desktop architecture had been king. Power and power densities of CPUs were still relatively low so this Intel design, later adapted to AMD processors, was never meant to address growing thermal challenges. 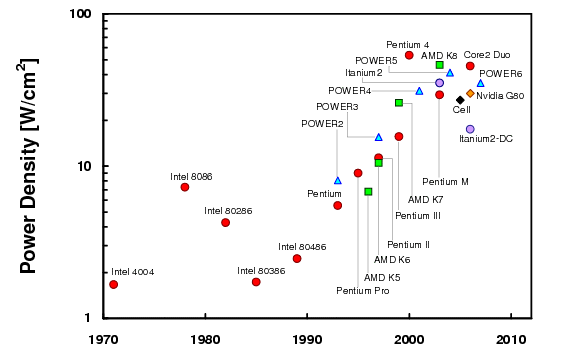 In those days, Pentium II and III processors were still in the 20-40 watt power range with power densities in the low to high teens (Figure 1). As you can see in Figure 2 (excuse my crude airflow drawings), a typical ATX layout positioned the CPU toward the rear of the machine with a single 100mm exhaust fan used to move air through the system. When necessary, a small fan was added on top of the CPU heat sink for further cooling but it distributed warm air throughout the system. Cool inlet air was impeded by forward connectors and memory modules that were perpendicular to, and positioned in front of, the CPU. Graphics cards where designed so that heat sink and associated fan faced toward the bottom of the case. From a thermal management standpoint, this design was marginal but adequate for the time. The long lived Pentium IV, with its’ every increasing power (80-115 watts in later iterations) and power densities (roughly 60-90 w/cm2), forced Intel to rethink ATX architecture and in 2003 it pushed a competing architecture whose primary purpose was better thermal management. The idea was simple. Give the CPU ample cool air and place all component in-line with the air flow. Figure 3 shows the first mass produced BTX design from Gateway (2004). Dell followed with a similar design the next year and HP as well as a few others soon got on board. The CPU was moved to the front of the machine where it could benefit from the coolest air. Rear exhaust fan diameter was generally increased to 120mm and in some cases (shown) at additional 120mm intake fan was added. A shroud was sometimes used to direct intake air over the CPU and move it in a straight line toward the exhaust fan. Additionally memory slots where positioned parallel to air flow and the motherboard was moved to the other side of the case. This allowed graphics cards to be flipped upside-down so the GPU fan received additional air and could more easily direct it toward the exhaust fan. Finally, there existed a thermally efficient desktop system design. Yes it was marginally more expensive – on the order of $10-$15 with larger fans and shrouding in addition to a non-standard layout – but the thermal benefit seemed to outweigh the cost premium. Engineers are often asked to tackle thermal challenges after system layout is locked. I know it’s not best practice, but it happens more than we’d like to admit. BTX gave us a better platform to manage heat, but it failed despite the fact that the latest generation of desktop processors (Core i7) still has power densities considerably higher than their Pentium III counterparts. So why did BTX fail to replace an aging ATX design? We’d like to hear your comments. Please contact us if you’d like to learn more about how Celsia can help with your next heat sink project. We’ve worked on everything from consumer devices to industrial test equipment that require heat sinks to cool anywhere from a few watts to a few kilowatts.